‘Don’t fall in!’ my brain screamed at me as I paddled through crunching sheets of ice. I’m a competent kayaker; just a couple of weeks prior, we had kayaked 100 miles around the Isle of Man, but capsizing in the frigid waters of a Svalbard fjord was a somewhat more daunting prospect than the grey silt of the Irish Sea. I laughed off the voice in my head and upped my tempo, enjoying the opportunity to release a burst of energy and splash Alex in the process. My biceps strained against the weight of the water. I felt free, as I always do on the water, and inhaled a deep, satisfying breath that filled my lungs with clean, crisp air. Mountains sprung from the edge of the water: white, rugged and dappled with tundra growth, the last evidence of a summer season past. Hiorthfjellet, our 928 meter-high quest for the day, sat directly ahead, watching our approach. Our hike started uneventfully and, brimming with enthusiasm, our group made a speedy start. We were led by Viktor, a gung-ho Russian with long hair, a cheerful disposition and a lackadaisical approach to group safety. As our elevation increased, so did the snow, and our pace began to slow. Viktor raced on ahead, his rifle casually slung over one shoulder in case we should meet any polar bears. A few group members slipped in the snow trying to keep pace with Viktor, and the beginnings of mutterings about the sensibilities of our guide began to echo up and down the line of hikers. We stopped at an abandoned mine shaft; a portal, frozen in time, into the harsh conditions in which miners lived and worked. The snow was falling thick and heavy, and the wind pounded at our eardrums. One woman decided she did not want to go on so a discussion was opened to the group. I was aware that in Alex’s backpack was an engagement ring that I suspected would come out at the summit – in my backpack was a watch – so I was keen to continue our hike. Viktor proposed cutting across the mountain to an abandoned mining hut, where we could shelter and have some food. I reluctantly conceded that I would not be proposed to today, not on this summit. Although once uttered in jest, the whispers about our safety under the supervision of Viktor grew more anxious as we began our route to the hut, and swiftly turned to exclamations of “this can’t be safe!” as we tiptoed as carefully as one can in hiking boots along a snow-covered ledge no wider than the footprint impressioned on it. Falling over now meant a tumble all the way down a mountain edge that would certainly result in death. I was enjoying the adventure and, unless we’re talking about public speaking, I generally have no fear, so this was an adrenalin-filled excursion that had me beaming. Alex not so much. He doesn’t care for heights, or ledges, or anything he can fall off. I could sense him getting angrier and angrier. We were at the front of the group, behind our guide, so were largely unaware of the events behind us. Periodic yelps and calls to wait told us that some were struggling. The woman who had expressed her desire to descend seemed baffled as to why we were still walking in a blizzard, and her husband’s patience was wearing thin. We both lost our footing a couple of times, reaching out to desperately grab at rocks as we slid. On one fall Alex sprained his ankle. This was the final straw. From this point on he lay face down flat against the mountain, with his arms and legs spread in a starfish shape, and shimmied along the rest of the ledge. I tried to contain both my laughter and the urge to preserve this moment in a photo, but succeeded only in one; we have no photo. Even if a journey is not as you expect, or you are unable to achieve its ultimate goal, the rewards can nonetheless be plentiful. Viktor was unfazed, still smiling and joking. Although we all thankfully survived the treacherous amble to the hut, a few members of the group lost their sense of humour along the way. Hot soup restored previous spirits, the snow had ceased and we all joyously bounded down the mountain to the awaiting kayaks. Although we didn’t make it to the summit and I had to wait to see my engagement ring, the views over the fjord and back toward Longyearbyen from the hut were worth the near-death hike. The icy water glistened and spread like veins into the snow-covered land. The white mountain tops oscillated across the horizon. The setting sun sent a warm glow across the frozen landscape. This was not the only example of a hiccup turned unexpected adventure during our time in Longyearbyen. We took a boat trip, for which we were kitted out in full-face goggles and a onesie that had me feeling like a sumo wrestler. It seemed like overkill but we were grateful once we were bouncing over the waves at high speed, icy water lashing up at us. More unharnessed rollercoaster than sightseeing boat ride, this wasn’t for the faint-hearted (or those prone to sea-sickness!). Each passenger was positioned between standing-height padded rails, to which we clung for dear life while being flung in every direction. 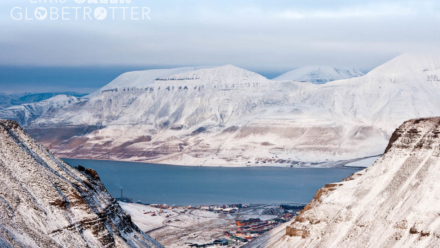 It was a heart-racing, fun-filled way to witness the beauty of Svalbard. Flawless glaciers shimmered under the saturated blue sky. A white veil shrouded the mountains, exposing traces of the tundra below. We scanned the horizon for whales, daring only to let go of our hand rails for a split second to point them out. We were taken past Barentsburg, the only remaining Russian settlement in Svalbard, and docked at Isfjord Radio. Mountains sprung from the edge of the water: white, rugged and dappled with tundra growth, the last evidence of a summer season past. We showed ourselves around, jumping over rocks and trusting that we would have been alerted to the presence of polar bears in the area. While taking our photos and exploring the peninsula, the waves picked up even more and we were told that our bouncy outbound journey had not been typical, as we had thought. No, the journey is usually calmer and drier. Sadly, the conditions had become dangerous and until the weather improved, we were stranded. The station was very comfortable and we all warmed up with a hot drink while we waited to learn our fate. The waves crashed relentlessly against the rocks and threatened to capsize our relatively small boat, should we venture back. A call was put out and we were rescued by the Coast Guard. This was an exciting and unexpected opportunity, and one that really opened my eyes to the range of work the Coast Guard do and the vessels on which they might be stationed. Once again, we arrived safely back in Longyearbyen, grateful for the adventure that had been handed to us, even if it was a variation on our expectations. For those that are curious, Alex and I did indeed exchange our engagement gifts in Svalbard, at the summit of Trollsteinen (Troll Rock). The hike across Lars Glacier to Trollsteinen was spectacular and from this vantage point, the colours of Longyearbyen’s houses popped against the white canvas on which they are scattered. The snow was thick and deep surrounding the glacier; the perfect location for a snowball fight! Dog mushing, which can be done in any season and is sure to be enjoyed by children of any age, was a great way to see out an exhausting day of hiking. We sped across the tundra, the cold air seeping in through the onesie we were given prior to setting off. The dogs eagerly pulled our cart (we were a bit early for a sledge), keen to exercise both their leg and heart muscles. We took it in turns to steer them, following our guide’s cart up ahead, while the other sat back and enjoyed the ride through the arctic. In writing about our time in Svalbard, I am reminded of a quote by author Greg Anderson: ‘Focus on the journey, not the destination. Joy is found not in finishing an activity but in doing it.’ It didn’t matter that we were unable to summit Hiorthfjellet or get the boat back from Isfjord Radio; both experiences nonetheless contributed to making our trip to the world’s northernmost city unforgettable. re you looking for the ideal ecotourism destination? Somewhere committed to both environmental and social sustainability? Look no further! I’ve asked some of the top travel bloggers out there for their input on their favourite eco locations. My family and I stayed at a rice farm in Malaysia recently, which was a beautiful place to relax in and an excellent eco-friendly accommodator to support. KOREF (Kahang Organic Rice Eco Farm) is a “leisure farm”, so it is not a place to work hard on farm chores, but rather learn a bit about farm life while having some fun. There are many activities visitors can choose from, including rice planting or harvesting, bamboo rafting, kayaking, a water obstacle course and jungle trekking. KOREF also has a sustainable fish farm, which guests can learn more about and even try to catch and release some fish. Another activity was wonderful for cultural understanding. Visitors can choose to visit an Orang Asli village in the nearby rainforest, with an excellent guide who works closely with KOREF staff. We did meet the beautiful people there, and were very grateful for the experience. KOREF is and organic farm at heart, and they use their own food as well as locally-sourced produce for the delicious meals provided to guests. KOREF also provides free filtered water from a fountain to everyone, and separates their rubbish for recycling. Unfortunately, this is uncommon from what we have seen in Malaysia. We loved staying there and getting a taste of farm life in such a beautiful setting. It is a great destination for kids with all of the activities on offer, and the fun and stress-free ways they help people learn about farming. School groups from cities in Malaysia and Singapore arrive often to get a very different view of life! Initiated in the late 1960s as an ecotourism project, Las Terrazas is a UNESCO biosphere reserve about an hour west of Havana, in the Cuban countryside. It is a lush complex with dense foliage, tropical swimming holes, waterfalls and 18th century abandoned coffee plantations. Although you can see Las Terrazas in a day, this is a place that merits more time to truly experience it. The town has something for everyone. Bird lovers will appreciate that Las Terrazas is home to almost half of Cuba’s endemic birds. The nearby Sosoa Botanical Gardens maintain a collection of rare orchids. There is a selection of trails led by students at the biosphere that take you through the local flora. For the more adventurous, there is also a thrilling canopy tour which whizzes you over six lines extending over lakes, a forest and much more. The artists in the colony live in town and their workshops are in their homes. People are welcome to enter their homes and watch them work, browse their creations and possibly purchase some very nice and authentic pieces of art. There is a little coffee shop in the area, Café de Maria, that bills itself as having the world’s best coffee. With advertising like that and at about .40 cents a cup, you have to try it. The local Hotel Moka sits on a hill-top with a beautiful view overlooking the forest and the small village. In keeping with the eco-friendly theme of the location, the hotel has a tree growing in the middle of the lobby and serves only locally grown produce. The two must-try restaurants in town are vegetarian and delicious! Tasmania is a nature lover’s paradise. This small island, about the size of Ireland or West Virginia, is home to vast wilderness and completely unique ecosystems compared to the rest of Australia, complete with endemic animal species and subspecies not found on the mainland. So precious are Tasmania’s varied landscapes — from verdant rainforests to mountains to white-sand beaches — that around 20% of its landmass is World Heritage listed. And that’s without mentioning its quaint country towns, impressive local food scene, and wealth of convict-era sites and ruins testifying to a rich, if often dark, colonial history. Unsurprisingly, Tasmanians are increasingly embracing sustainable tourism. But few places boast the eco-friendly credentials of a certain private nature reserve in Tasmania’s northwest by the name of Mountain Valley. Situated on some 61 hectares, this reserve is run by a husband-and-wife team with a passion for wildlife and conservation. To protect the vulnerable habitats and fauna on site, they’ve signed schemes agreeing that their property can never be logged or degraded. It’s also a release area for rehabilitated wildlife — and a one-of-a-kind, no-frills accommodation option, complete with 1970s-style log cabins. With old growth forests, caves and even a glowworm grotto, Mountain Valley is a haven for wildlife. Wild echidnas, wombats, platypi, possums, Tasmanian native hens, pademelons, spotted tail quolls and the sadly endangered Tasmanian devils all call this place home. Lucky guests may even just find a few local critters on their very doorstep. Iceland is a wonderful eco-friendly destination and one of the world leaders in sustainability. The nature of Iceland is so pristine and clean that it is almost impossible to wrap your head around how pure things are there. While tourism is on a major rise there, the country is doing everything it can to cater to this tourism boom in a sustainable and ethical manner. Nearly 100% of Iceland’s electricity comes from renewable energy, which is remarkable and a model that every country should aspire to follow and achieve. Another thing I loved about Iceland, Reykjavik in particular, is how easy it was to find vegetarian and vegan options. You don’t necessarily associate Iceland as being meat-free, but the options are there in masses. You can rent a bike with ease in Reykjavik, too. I think Iceland is a country that really sets the benchmark for clean energy and spectacular nature. In Indonesia, just a boat ride away from Bali, in the paradise island that is Gili Meno, you can find the Eco Hostel Gili Meno. Gili Meno is a small island that can be walked in 1 hour and the Eco Hostel is conveniently located by the seaside in front of Turtle Point, where you can snorkel with turtles. The Eco Hostel is an incredible place that is all built around the logic of sustainability and eco-tourism. You can sleep in bungalows by the beach on just a simple mattress or in the fantastic Treehouse, while the concept of dorm-room is taken to another level by letting you sleep in hammocks that can be zipped from the inside to avoid mosquitos nuisance in the night. The toilets are composite toilets and the showers are half salt water and half spring water. Everything is built out of wood. There is a bonfire area by the beach and in the morning people wake up before sunrise to enjoy the majestic natural show in the communal area. It is a place that you will never want to leave, once you get used to the slow pace of life and to the chess challenges with the young Indonesian boys working in the hostel. Wisconsin offers unique travel destinations and was home to environmental legends, John Muir, Gaylord Nelson, and Aldo Leopold. Travel Green Wisconsin certification recognizes businesses that have made a commitment to reduce their environmental impact. Here are just a few. Wilderness On the Lake is an upscale resort in the Wisconsin Dells, “The Waterpark Capital of the World”. The dells offer indoor and outdoor waterparks, live entertainment, thrilling attractions, and awe inspiring natural beauty! Door County Bike Tours is an eco-friendly way to experience Door County, “the Cape Code of the Midwest” – a peninsula between Green Bay and Lake Michigan – where you can watch both a sunrise and a sunset over the water! It offers cherry orchards, art galleries, wineries/breweries, five state parks, 19 charming communities, fish boils, and 11 historic lighthouses! The Apostle Islands National Lakeshore consists of 12 islands and coastline on Lake Superior, hosting a unique blend of culture and nature including sea caves, nine historic lighthouses and shipwrecks. Discover each island’s story via tours, kayaking, and hiking. They host endangered plant species, important nesting habitat, and one of the greatest concentrations of black bears! The Harley-Davidson Museum, in Milwaukee, isn’t your typical museum. The interactive displays provide a unique experience, exhibiting more than 450 motorcycles and artifacts on a trip through time. It was the first museum to gain the GREENGUARD Indoor Air Quality Certification and has an ongoing process for environmental improvements. The Stonefield Historic Site, located along the Great River Road in Wisconsin’s Driftless Area, includes a re-created 1900s rural village, the State Agricultural Museum, and the homesite of Wisconsin’s first governor, Nelson Dewey who has a nearby state park. These are just a select few of Wisconsin’s eco-friendly destinations! Explore the ‘Travel Green Wisconsin’ website and come take a look for yourself! Germany is the ideal destination for the eco-conscious traveler. A country full of history, culture, fabulous cuisine, and beautiful landscapes, it has so much to offer, but it is impossible to be an economic leader and be ecologically oriented, right? Wrong! The German government is making dramatic strides in environmental issues. Nuclear power is being phased out, and replaced by renewable energy forms. The Cogeneration Act requires manufacturing firms to utilize the “waste heat” created in their production processes. Rather than being demolished, old factories are often converted into cultural centers and tourist attractions, old wastewater facilities into bird sanctuaries, and military bases into wildlife habitats. Old buildings are also upgraded to meet new standards of efficiency, and re-forestation efforts have saved the Black Forest and cemented its status as one of the country’s greatest treasures. But what is refreshing is that the German people embrace the environmental policies. Extensive recycling is legally required, but also widely practiced. Each home and public venue has a number of separation categories for trash, so that little more than biological waste ends up in the landfills. These separations were diligently applied in homes. Nosier neighbors even make a point to check on the recycling practices of others on the block! But more surprising is that the separations are made in public as well. On the train, in the park, walking down the street, people visibly separate their disposable items into the correct categories, and take the time to put each in the proper bin. Watching this gave me hope! Time for my contribution! There are so many wonderful places to choose from but this one deserves a special mention; Alex and I chose it as our wedding venue for good reason! 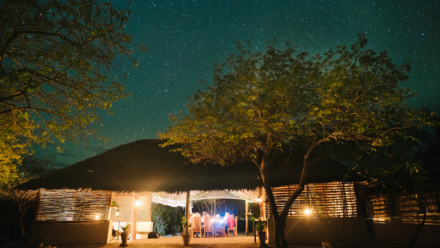 Guludo Beach Lodge in the Quirimbas National Park is an award winning ecotourism destination, with an ethos firmly rooted in social and environmental sustainability. The lodge was designed so that no trace would be left, and has been constructed using only local, natural materials. There is no running water or electricity, and yet it feels luxurious. Built and staffed by the local community, every decision was, and still is, made following consultation with the village residents. Located right on the beach, the setting is beautiful, the seafood is fresh and delicious, and there are numerous activities on offer to delight both adults and children. A percentage of your fee will go to the onsite charity, Nema Foundation, which has funded multiple wells, school meals and resources, ambulance vehicles, and construction projects. The staff are Guludo’s best asset and they will go out of their way to make your stay memorable. Certainly, we will never forget them or their bright smiles! Find out more about the highlights of this beautiful country here in my recommended two week itinerary, which will give you a taste for all that Mozambique has to offer. Thanks to Alex Miller for the photo, taken at our wedding.